This week’s Apps on Tap will feature some useful apps that can help you maintain your New Year’s resolutions this year. 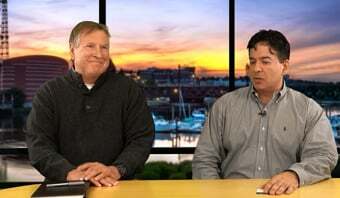 While perpetual yo-yo dieters and binge eaters stuff their faces with their “last” donut of 2012, anxiety starts to set in when January 1st rolls around and their New Year’s diet begins. Just because it’s a new year doesn’t mean it’s any easier to find motivation to exercise, but with the help of GymPact it may feel a little less daunting. How you might ask? Well, what’s a better motivator than money? With the app, users earn cash for exercising. 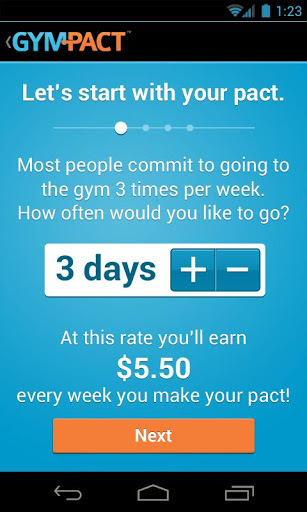 First, users make a pact, similar to a goal, based on how many days they plan on exercising. Then, the user sets the “stakes” for how much they are willing to pay if they fail to keep their pact or goal. To keep users accountable and on track, users are required to check-in via GPS on their mobile device at the gym. Users can also check-in and complete fitness goals with RunKeeper. To confirm a complete workout, the app tracks a user’s location with time intervals to make sure cheaters aren’t rewarded. User’s who fail to keep their pact are charged $5 per exercise missed. The money collected from people who did not meet their pact is pooled and divided among users who met their pact. Not only does the app reward users for exercising, it also gives users a complete overview of workouts and the ability to manage weekly work-outs in a fun and easy way. Users can even share their workouts and invite others to join. Instead of fattening up yourself this year, why not fatten up your wallet instead! Happy jogging! With the holiday shopping season behind us, it’s no surprise that our wallets feel a lot lighter going into the New Year. Instead of telling yourself that by this time next year you WILL look like Gisele Bundchen, why not make a resolution that you know you can keep. Ah, the smell of money. Have your money smelling fresh with the Mint.com app. Mint.com allows users to track, budget and manage their money from one convenient easy-to-use place. First users open an account on mint.com. After the user adds their bank, credit, loan and retirement accounts, Mint will automatically transform and categorize all transactions. 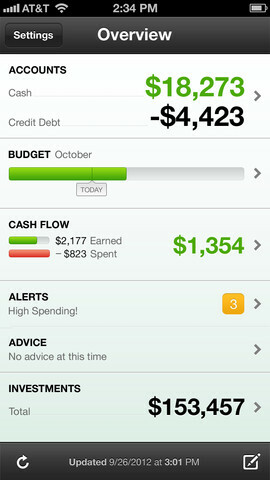 With the apps intuitive interface, users can manage and organize their finances with fool-proof graphs. Using existing information and current spending, Mint will create a customizable budget just for you. Always on the go? No problem. Users’ banking information automatically syncs across different devices so users can access their Mint account securely from a mobile device or the Web. Users can even set bill reminders and alerts to avoid late fees. Get smart with your money this year, who knows you could become the next Warren Buffett in the year 2014! Now that you are working toward a runway bod and a fatter wallet, why not organize the rest of your life in 2013? OCD list makers, planners and space-cadets listen up; we have an app for you! 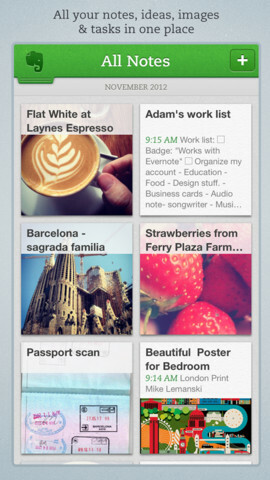 Evernote is a user-friendly app that helps you remember every last appointment, dinner date or list. Evernote allows you to do everything from taking notes, saving pictures, planning a vacation, to recording voice reminders. Users can sync notes across all devices, making it easy to be organized on the go. Not only can you save and create important tasks, you can also share notes with friends through Facebook and Twitter, connect to other apps or products you use and e-mail notes or tweets to your personal Evernote account. To ensure optimal efficiency, users can organize notes or lists by tags or use the search tool to find exactly what they’re looking for. Evernote isn’t just for perpetual list-makers or business folks. Use the app to organize and save recipes, grocery lists, design ideas or shopping wish lists. The user-interface is neatly organized so users can quickly and easily find what they need. Forget where that hidden coffee shop you visited a month ago is? With the Evernote app, just tag the location and visit your “places” tab to find the exact location. The app comes with two premium subscription options. The premium option allows users to take “notebooks” offline, allows others to edit notes and features a PIN lock to ensure safety. The start of a new year can be a drag, but it can also be a new beginning or a chance to get this year right. So start it off with a BANG with these helpful apps and make sure to tune into next week’s Apps on Tap. Happy New Year!